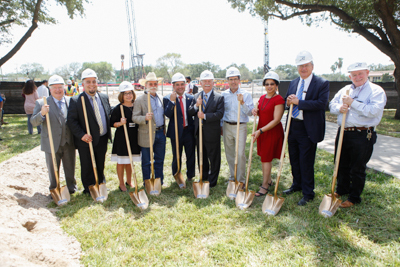 Javelina Nation came together today, Tuesday, Sept. 19, to officially break ground for the new music education complex at Texas A&M University-Kingsville. The initial ceremony was held inside Jones Auditorium, adjacent to the construction site, and the action moved outdoors for the official turning of the soil. The building is being built by SpawGlass. Craig Reynolds of Brown Reynolds Watford Architects in Dallas is the principal architect. The basic building will cost $47.9 million with additional costs of $13.7 million for infrastructure, technology, fees and furnishings. The university was awarded $60 million in Capital Construction Revenue Bonds from the state to build a new music building. It will be nearly triple in size from the current building from 32,000 square feet to 90,000 square feet. It will have a 450-500-seat performance hall, a 100-seat recital/lecture hall, four large rehearsal halls for band, choir, orchestra and jazz band and three chamber music/methods halls. It also will include 48 student practice rooms, 32 faculty studios/offices, five classrooms, two student study areas, one computer music lab, one electronic keyboard lab, one recording studio and one administrative office suite. The new building will replace the Bellamah Music Building that was built in 1959 to accommodate 100 students and 12 faculty members. As the program has grown and succeeded, it currently houses 250 students and 30 faculty members.